Work on the reroof began in earnest today. 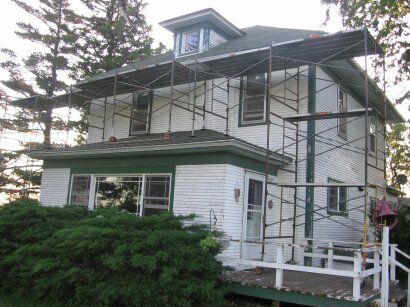 The scaffolding was set up yesterday. It’s amazing how quickly it goes up and how it fits so well. 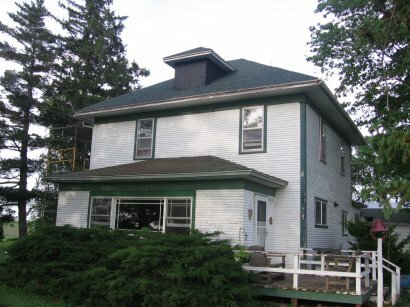 Today the west side was torn off (layers of asphalt and cedar shakes), new sheeting put down, and new shingles put up (along with old dormer stripped and readied for new siding and windows. I don’t want to go up to the third floor again. The west side was completed in a day. Tomorrow, off to to the north. Yesterday we went fishing for a spell. 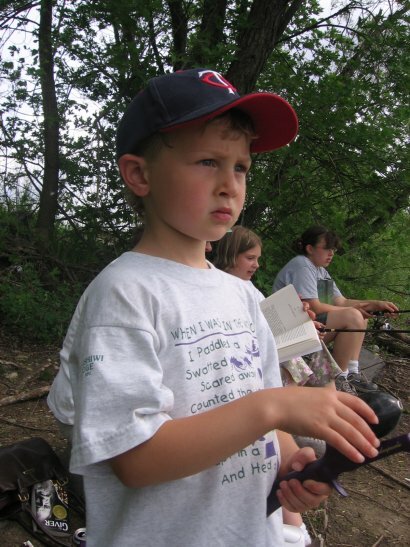 Everybody’s concentrating on something – a book or bobber. 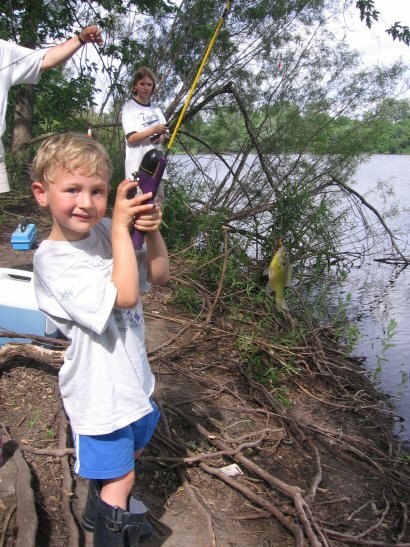 Martin had the hot hand and caught the most fish! Today we made our annual pilgrimage to the township cemetery two miles down the road. 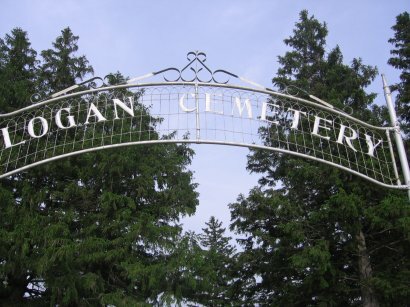 We don’t actually know anyone buried there, but it seems appropriate to go there on this day. 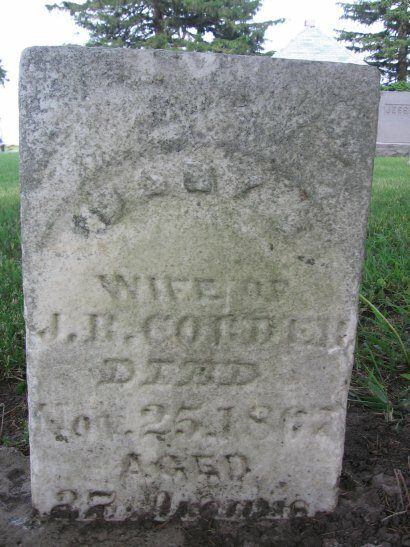 We usually go look at the gravestones and try to imagine what life must have been like in their time. There are many more babies and children who died at a young age than there is now. After walking around, we sit on a bench, look west and talk about people we know who have died. 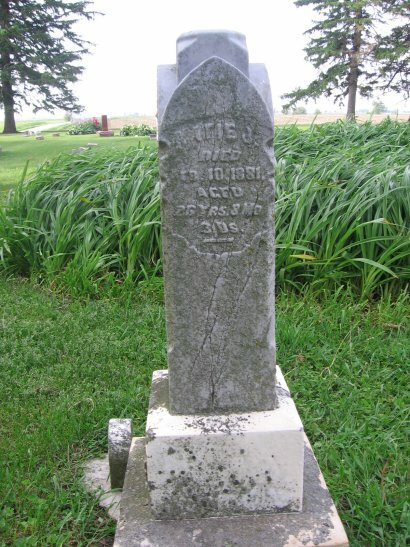 The cemetery is one of hundreds of township cemeteries in Iowa. 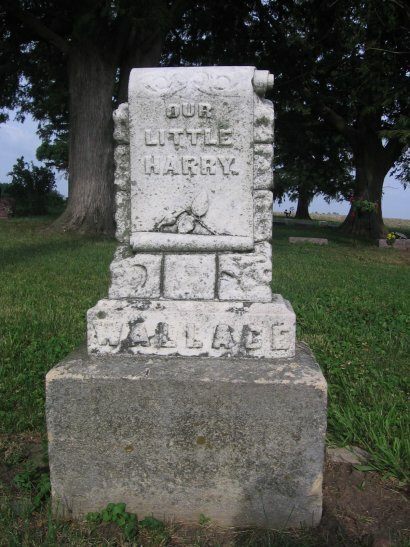 Most every township (six miles square) had a cemetery and a one room school house. I imagine the people buried here would be startled to learn that the new life they started here did not support their heirs and that most had to move on. There were more people in this township in 1920 than today. The consolidation of farms has dropped the population through time. We spent a bit of time cleaning up this afternoon. We put the tractor to good use. 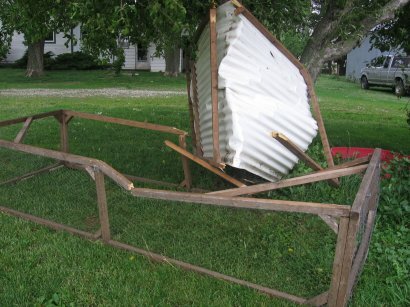 The limb that fell on the machine shed was to big for me to budge, so… loader tractor to the rescue. A chain, a tractor, no problem. We loaded a hay wagon with branches from the yard. Here is a photo Martin took of Linda unloading the wagon. Stay tuned for pictures some day soon that Martin took today. 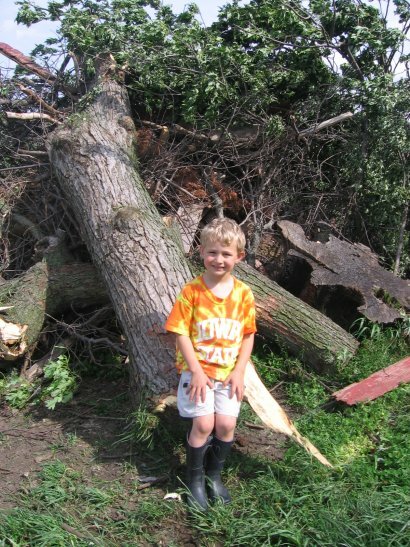 Here is the little guy on the biggest limb that we loaded on the burn pile. It is probably not noteworthy to all you long-time farmers out there, but having the ability to lift up and move a log like this is just a treat and saves the back! The weatherman has been promising a great Memorial Day weekend, hot and maybe a bit breezy. Last night a small chance of late afternoon thunderstorms was added – but a small chance. Evidently the storm at 5 am that woke us up was 12 hours late (or early)! 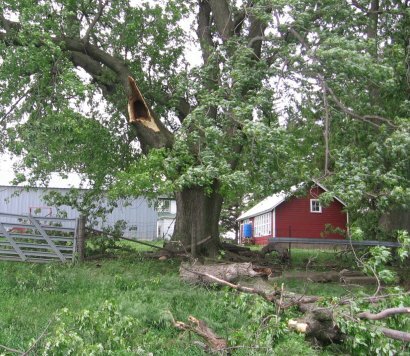 This afternoon damaging winds blew through, not as part of a thunderstorm, at least not here. It made my work for the next few days clear. I moved the chicken tractors out of the barn a few days ago to check them over as the chicks may get in them later this week. The wind wrapped it around this apple tree very nicely! Lots of small limbs are on the ground and are on the garage roof, shed roof. 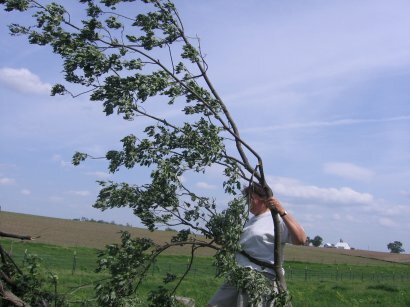 A big hollow limb off a silver maple fell off in the back pasture. There a lot of branches in the front yard snapped off, but still hanging in the trees. There were at least a dozen bird nests blown to the ground as well. 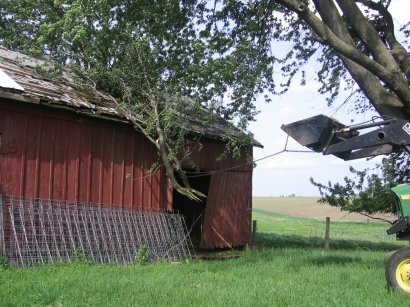 I didn’t notice right away that the back door of the barn had been ripped off as well. I heard Paullina bellering especially vigourously and went to check. 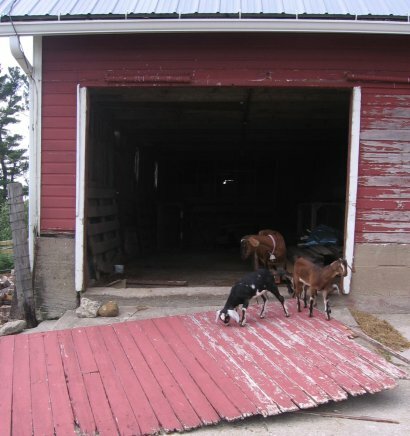 I could hear a kid (goat) whining in what sounded like a part of the barn that wasn’t supposed to have goats. I went in and couldn’t find her. We still have a few layers of hay against one wall of the barn, about 6 bales high. The sound was coming from within the bales, so I started unstacking the hay. Sure enough, the kid (Millie) had gone through the place where the door had been, climbed up to the top of the hay and fallen in the crack between the hay and wall. When I got to the bottom and could see her, she wasn’t moving – her head was stuck between the bottom bale and the wall and she couldn’t lift it up – her momentum must have wedged it in pretty good. With trepidation, I pulled the bottom bale, not knowing if she had broken anything and she was fine! We lost power and as I went out to check on neighbors, I saw the reason for the outage. 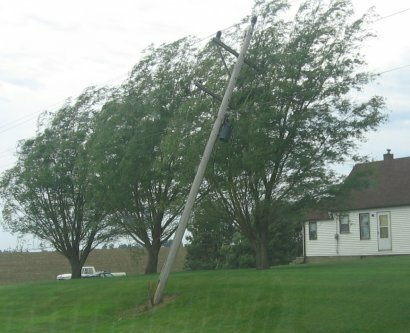 A powerline snapped at the ground in front of our closest neighbor’s house to the south – and didn’t fall to the ground because it was leaning against some trees. 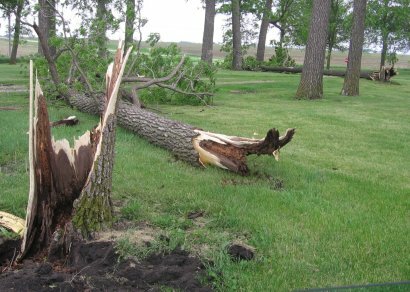 The other direction from this neighbor, a big silver maple blew down (away from the house) and the small park a mile away lost trees as well. Today was one of those rare days that more “farming” got done than planned. 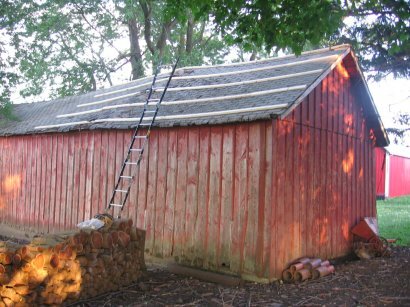 Spent the morning loading up a load for the dump and getting supplies in town and in the afternoon started getting ready to reroof the back side of the old machine shed. First task was to nail 2x4s across the roof into the rafters. The roof has a great hump (where two buildings were joined). So, I tore all the asphalt and cedar shingles to get down to the sheeting on the hump to help smooth out the hump. Got all the boards pounded in. Even got three sheets of roofing up – about nine feet. I was hoping to get it done this long weekend, but about 3/4 done today – should be a snap! Linda got some serious weeding done today. 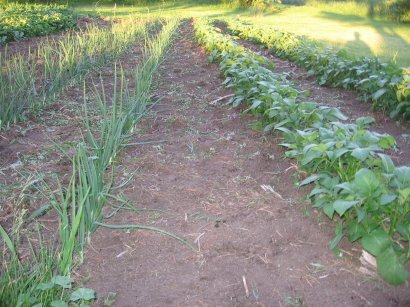 Here’s a view down the onions and potatoes. GJ got lots of patio blocks set around the new raised beds. 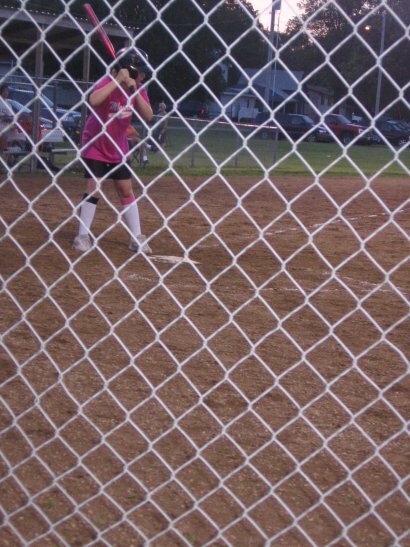 It was hot and calm – a day that felt and smelled like summer. So it was the first time to Ev’s in town for ice cream after dinner. Any guesses what this crop is? 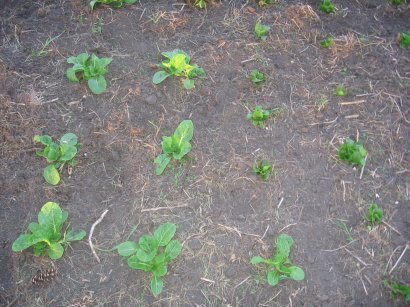 These are Chinese cabbage and raddicchio – looks like they like the wet weather of late. This week’s Photo Friday Contest theme is “Home.” Here is my entry. 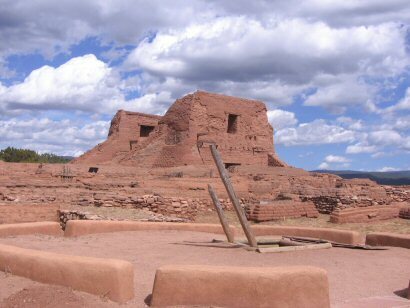 This is a nice juxtaposition of the ruins of a Spanish church and native kiva. This is at Pecos National Monument in Northern New Mexico. Here’s this week’s “Thingamajig Thursday” entry. Also check out last week’s answer. 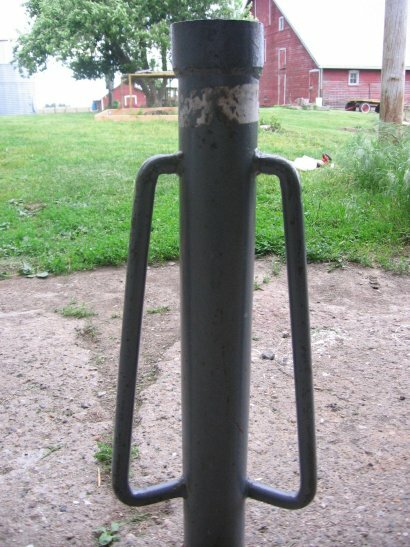 A steel fence post driver (armstrong model). 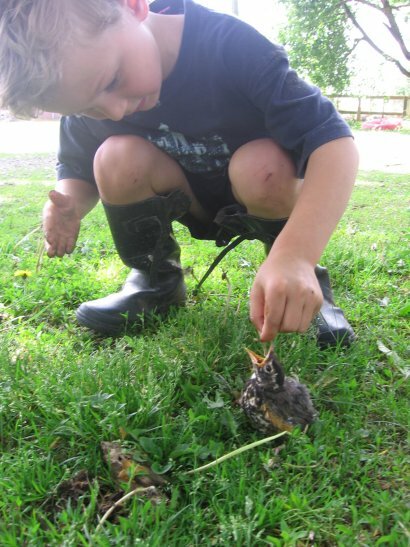 Yesterday I wrote about the abundant living and dead fledglings – today I caught Martin playing moma robin! If you look closely, you may be able to see the worm he found for the robin dangling above the bird’s mouth. After he fed it 3-4 worms, we put the bird in the compost bin so it was safe from dogs and had plenty of food. The real moma robin found it and took over feeding from Martin. We have separation of duties at the farm today – Linda takes care of manure and I take care of dead bodies. Today was clean out half the chicken coop day. It was easier with the tractor as we positioned the bucket by the door and Linda could just throw it an and wet it down all at once before taking it to the compost pile. It was lawn mowing day – got some more weeding done and some ground dug up for a new raised bed. 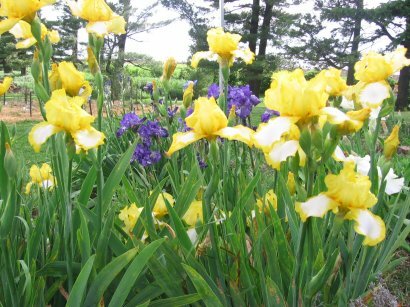 The first flower bouquets are in the house – the iris are in full bloom. This is the season for baby birds. 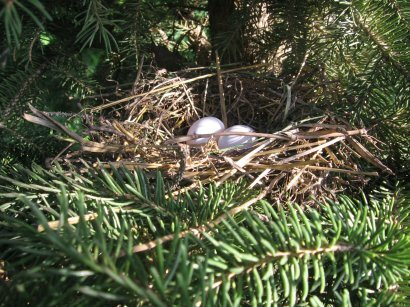 Here’s a Mourning Dove nest nestled in some pine branches. There must be many nests in our trees if the broken eggs and dead fledglings on the ground are any indication. I think some are blown out of the nest and some must be caught by cats/dogs before they are strong fliers. May 22, 2006 – No Flame Decals on that Tractor! Today, the tractor was ready to be picked up at the John Deere Dealer after they fixed the problem that filled the crankcase with gasoline. They didn’t have the ticket written up, so they let me drive it home without paying for it (yet). They drove it out of the shop and noticed some gasoline was leaking around one of the newly installed parts. They went to fix it and the service man was fiddling with it for a few minutes, when he suddenly runs away from the tractor and grabs a fire extinguisher to put out the flaming engine block! I’m sure that flaming tractors in the lot are not good for advertising! It was extinguished in moments. The gas that was leaking out was ignited when a wrench arced across a wire that was missing its plastic coating. After it was all fixed, I had a 12 mile or so tractor ride home. I lost my fondness for ever participating in the “Great Tractor Ride Across Iowa.” Twelve miles was enough. 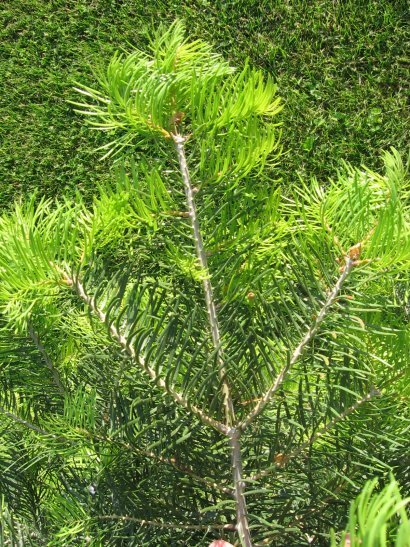 I’ll leave you with one picture for today – the minty new growth on the concolor fir. The last 2 weeks, the trees have really taken off with spring growth – some of the black cherries and bur oaks already have grown 4-6 inches. 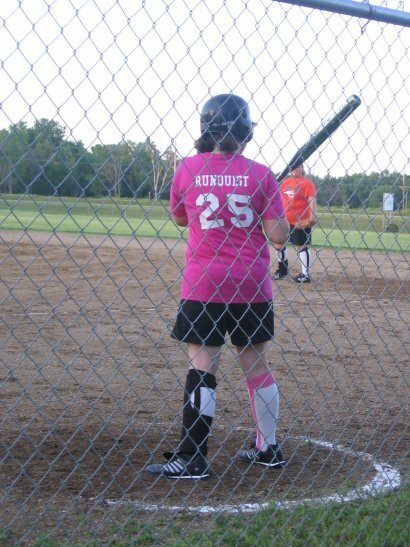 Last summer Emma took a GPS class and part of the class was to hide a “travel bug” with instructions and an ID tag. 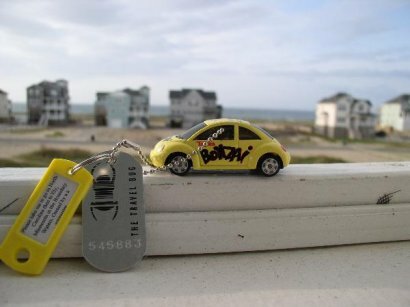 For her travel bug, she appropriately chose a VW Bug. She hid the bug, logged onto the geo caching web site and left the coordinates along with instructions where she wanted the bug to go. She chose her bug to go to North Carolina, then the Boundary Waters near Ely, MN. She logged in to check the progress this weekend, and found a picture someone had posted of her bug on the North Carolina Coast! So now it will head back to Minnesota. Each time someone finds it, they move it closer to its next destination. The person who finds it, goes to the web site, logs that they found it, perhaps takes a picture of it, and hides it further down the road and leaves the GPS coordinates for the next person to find. You can track the progress of the Yellow Bug at the Geo Caching Web site. It’s another keeper of a day. Lots of little things today. Planted a dozen peppers, spent half the morning in town getting lumber and running errands. 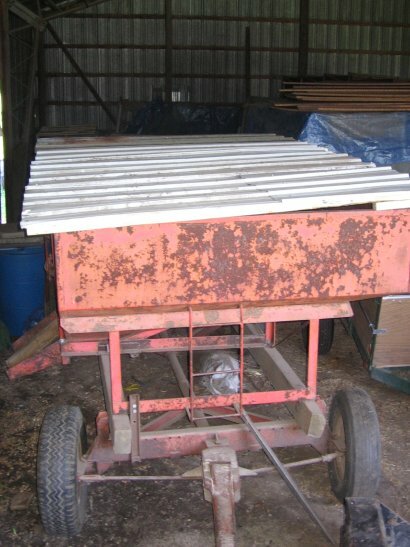 Built a waterproof top for the gravity wagon that is storing chicken feed. We had some makeshift tarps over it before and a few leaks in the shed found their way in, so it was time to make a permanent solution out of leftover pieces of steel roofing. 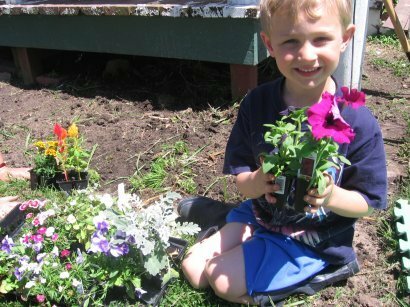 Martin is helping Mom plant her Mother’s Day flowers. Linda made three batches of soap – among them what looks like a better goat milk effort than the first time around. 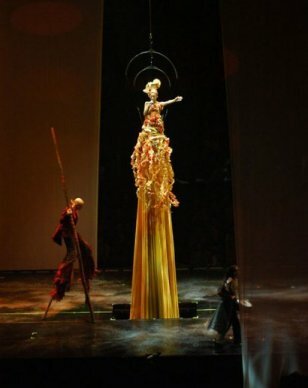 Tonight Linda and I had an escape, we went to see the Cirque du Soleil road show, Delerium in Des Moines. It’s hard to describe the show – merging acrobatics, dance, broadway, art, lights, all addressing the limits of human potential. But if you went to see it, you’d probably have a different interpretation. The following photos are linked from the show’s website (no cameras allowed). 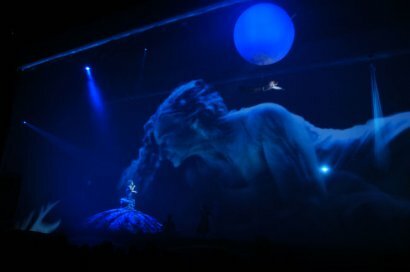 The stage was a runway the length of the arena, with a veil pulled over (literally and figuratively) which allowed projections to be superimposed over the performers. This woman looking at the live performer, morphed from a beautiful young woman to a beautiful old woman, finally dissolving into the floor. It was an interesting medium, not quite film, not quite theatre. 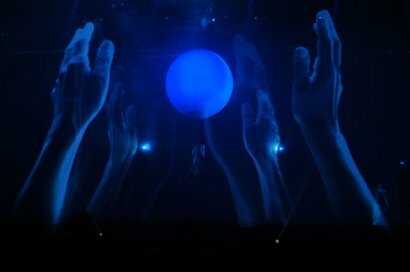 Again, here is a performer suspended with a giant ball within the projection veils. This woman came up through the floor, had a long dress. 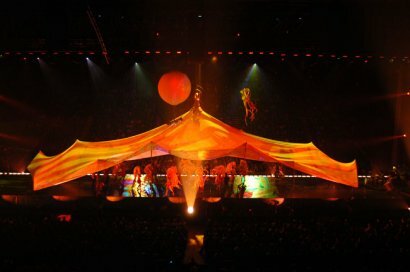 Then the dress was pulled out to the length of the stage and dancers were under it, visible by their shadows under the dress only. Then the dress was made into a tent. It is a great show!